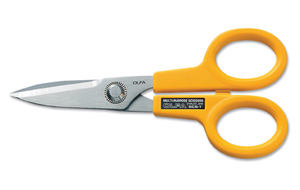 OLFA Scissors SCS-2 Model 9766 7"
OLFA Serrated Edge Scissors feature stainless steel blades sharpened to the tip for precise cutting. The scissors also have a semi-blunt nose for added safety and an aerospace-grade rivet for strength and leverage while cutting. The handles crafted of light-weight but extremely durable ABS plastic are for right-or left-handed use. The Serrated Edge Scissors have extra sharp blades made from high quality stainless steel designed for heavy-duty industrial cutting. One blade has a serrated edge which helps to prevent slippage of the material being cut. 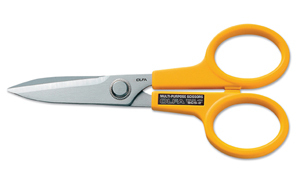 These heavy-duty scissors are available in 5-inch and 7-inch lengths. Both will cut through the toughest industrial materials including polymers, wire, Kevlar®, vinyl, rubber, fabric, aircraft composites, and more. They are also handy as household scissors for the kitchen, workroom, and do-it-yourself projects. OLFA Scissors SCS-4 Model 1096876 Precision Applique Scissors. Extra-Large Handle For Comfortable And Accurate Cutting. 5".